Ibaraki Prefecture (茨城県, Ibaraki-ken) is a prefecture in the Kantō region of Japan on the island of Honshu. The capital is Mito. In 1871, Ibaraki Prefecture was created from Hitachi Province. Ibaraki Prefecture is the northeastern part of Kantō. It is between Tochigi Prefecture and the Pacific Ocean. 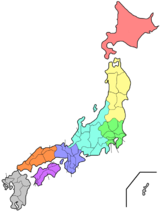 Fukushima Prefecture is its neighbor to the north and Chiba Prefecture is to the south. Saitama Prefecture is to the southwest. There are many mountains in the northern part of the prefecture. The rest of the prefecture is a flat plain with many lakes. ↑ Nussbaum, Louis-Frédéric. (2005). "Ibaraki-ken" in Japan Encyclopedia, p. 367; "Kantō" at p. 479. ↑ Nussbaum, "Mito" at p. 642. This page was last changed on 1 October 2017, at 01:04.